Apple has updated the statistics of its App Store support page for the second time since the official unveiling of the latest iOS 12 mobile operating system to inform us about its adoption among iPhone and iPad users. 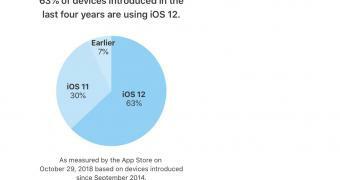 On October 10, 2018, Apple published the first statistics about the adoption of its iOS 12 mobile operating system on supported iPhone, iPad, and iPod touch devices, stating that more than half already run the latest software version. More precisely, iOS 12 ran on 53% of all devices introduced in the last four years, and on 50% of all devices.